These tacos are crazy good! I have been seeing some recipes for honey sriracha chicken lately and they all looked lovely. The spicy sweet sauce soaking into a bed of rice seemed like something we could really go for. But, we have been having a lot of rice lately. So, I decided to do something a bit different. Instead of making the chicken on the stove, I went for the slow cooker and instead of rice I went with tortillas. Best. Plan. Ever! I started with some recipes I found on pinterest for honey sriracha chicken. They all were made for the stove top and had a lots of scrumptious sauce that would be perfect to soak into the rice. I adjusted the ingredient list a bit. I still wanted all of that big flavor and enough liquid for the slow cooker to cook my chicken effectively. But, I didn't want all of that honey and sriracha dripping down my arms as I tried to eat my taco. So this has a nice thick sauce that clings to the chicken and stays in the tortilla. 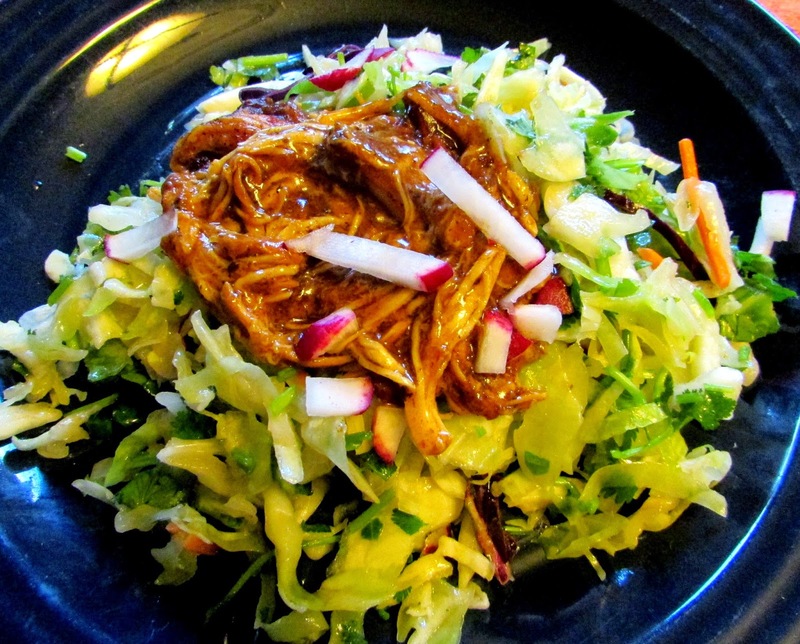 We topped our chicken with some honey lime slaw and WOW! It was good. A really nice fusion taco with big flavor. 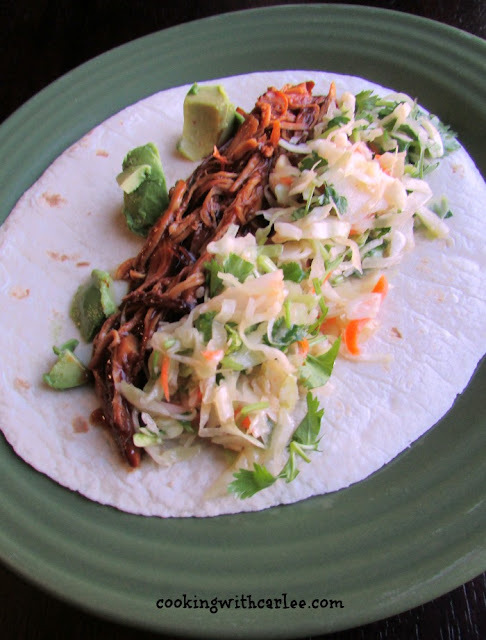 It packed just enough heat, just enough sweet, a little bit of crunch from the slaw all wrapped up in a soft tortilla. In slow cooker crock, mix together water, sriracha, soy sauce, garlic, sugar and honey. Add chicken breasts and cook on low for 6-8 hours. Shred chicken with forks. Mix corn starch in just enough water to make a slurry and stir into chicken mixture. Turn slow cooker to high and cook for at least 15 minutes more or until sauce is thickened to your desired consistency. We really enjoyed our chicken in flour tacos, covered in honey lime slaw and a few radishes for crunch. It was also good as a "taco salad." Too funny! There is enough honey and brown sugar in here that it really isn't too hot. Have a great weekend! I am so pinning this, it sounds great, I love anything that I can put into a tortilla! Thanks! Thank you! There is something about rolling food up in a tortilla that makes it a bit more festive. I hope you enjoy it! I've been on a serious taco kick lately. Pinning to try! Carlee these look and sound so good! I'll be featuring you this week at Talented Tuesdays I would love to have you link up more of your yummy recipes again! Thank you! I can't wait to see what everyone has been up to. Thank you! I haven't made them in a while and now I am craving them! I need to put them on the menu again soon.